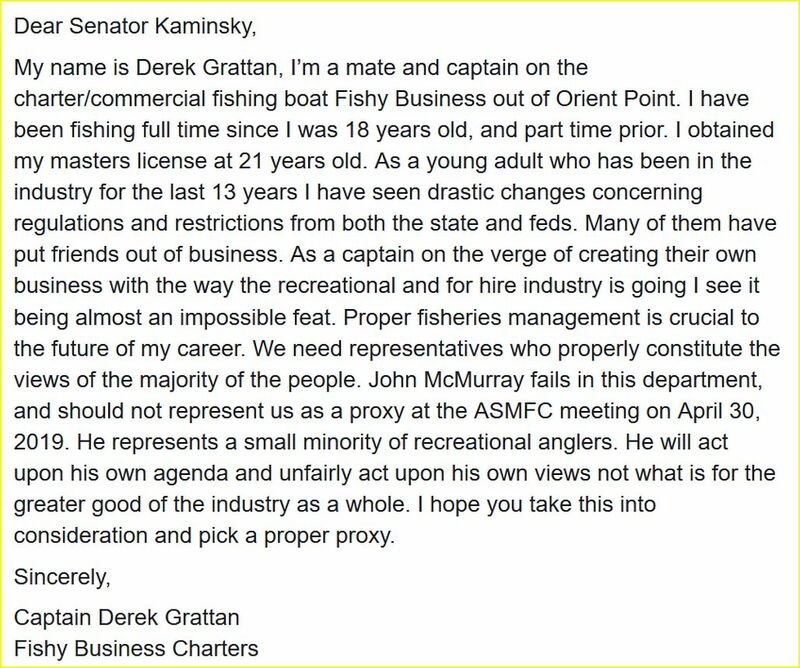 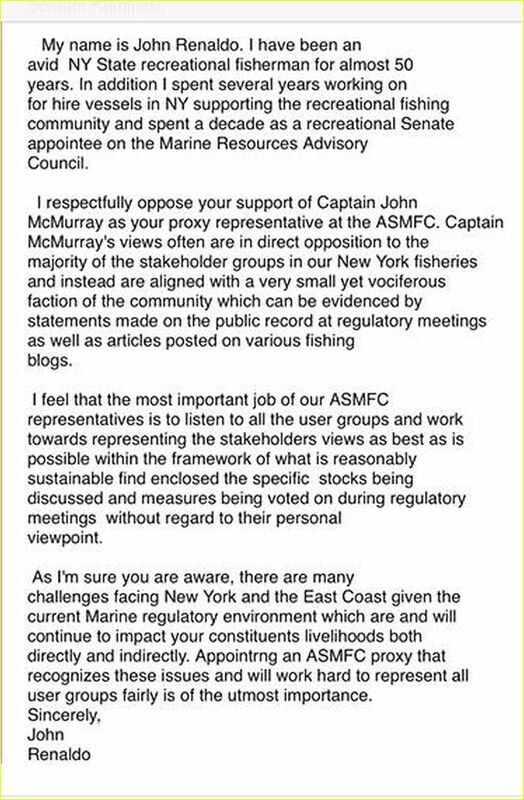 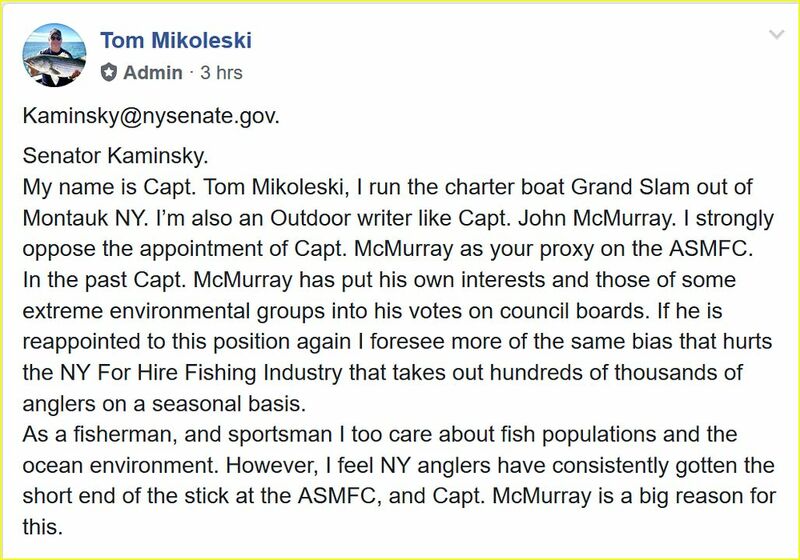 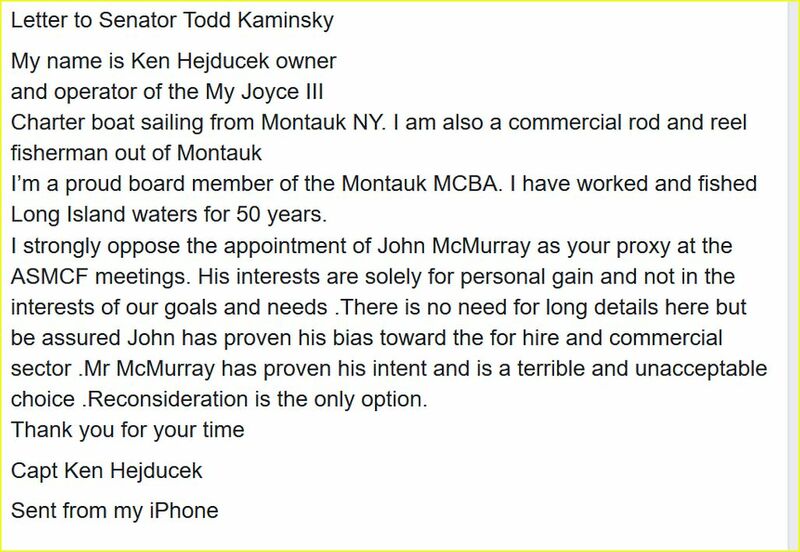 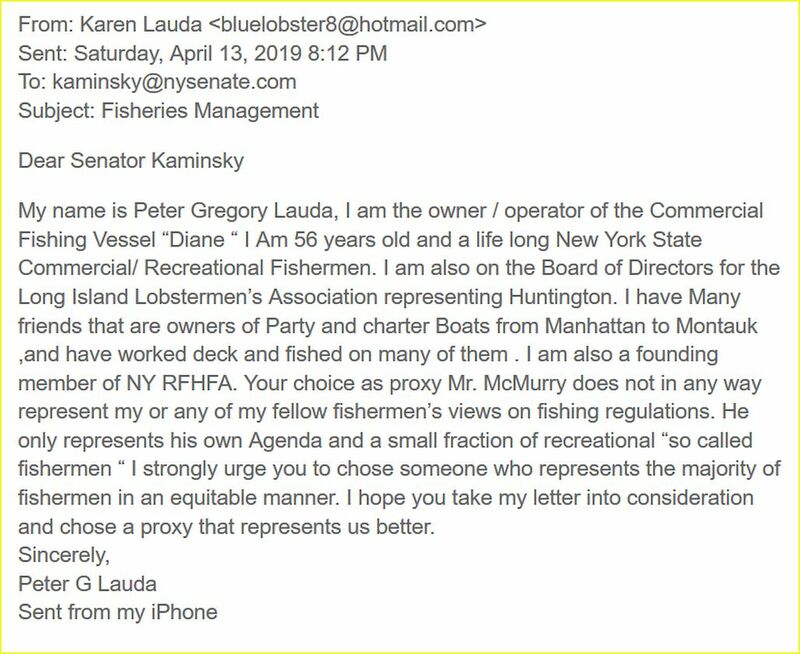 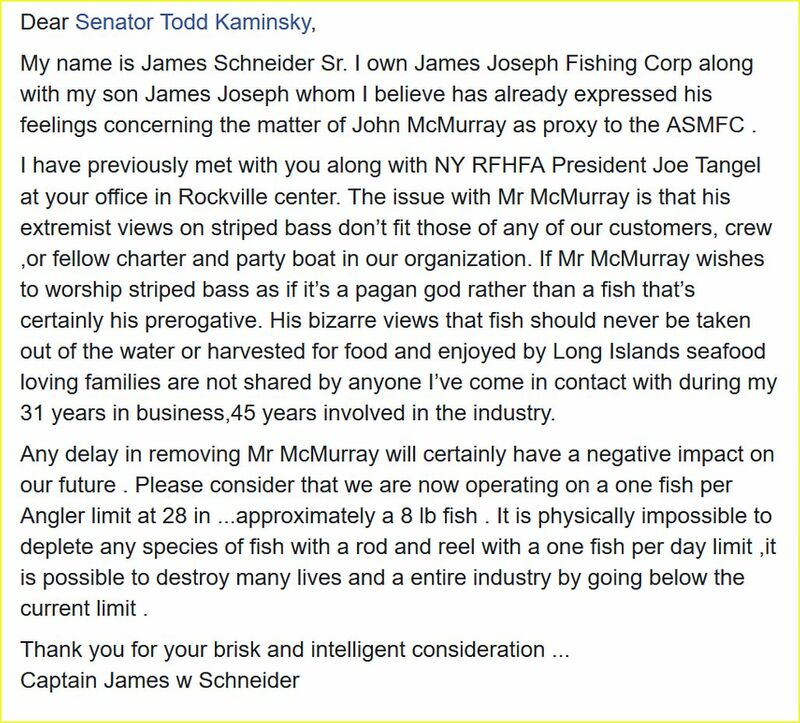 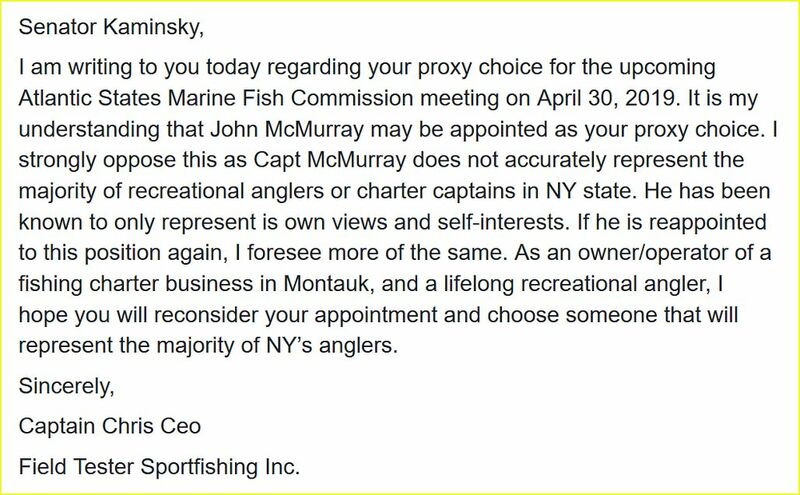 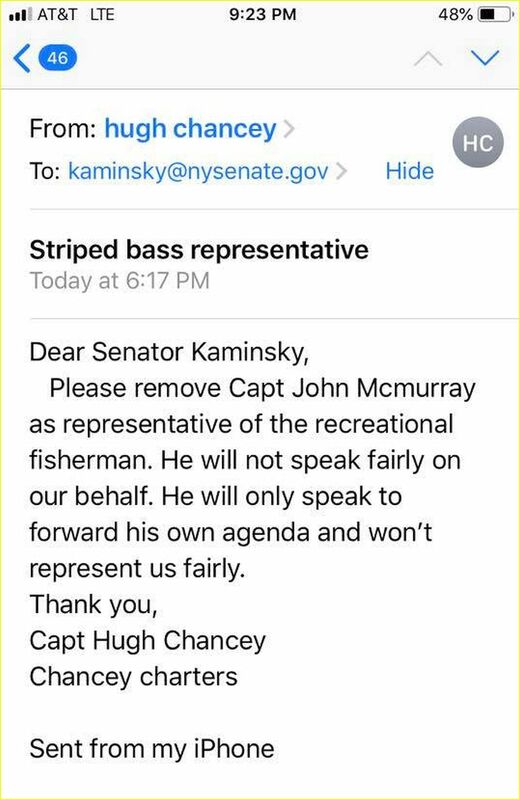 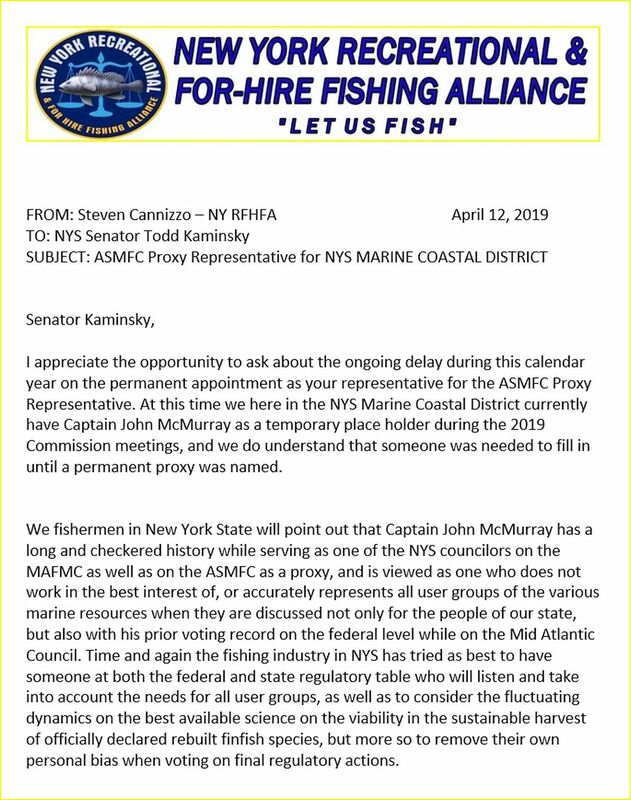 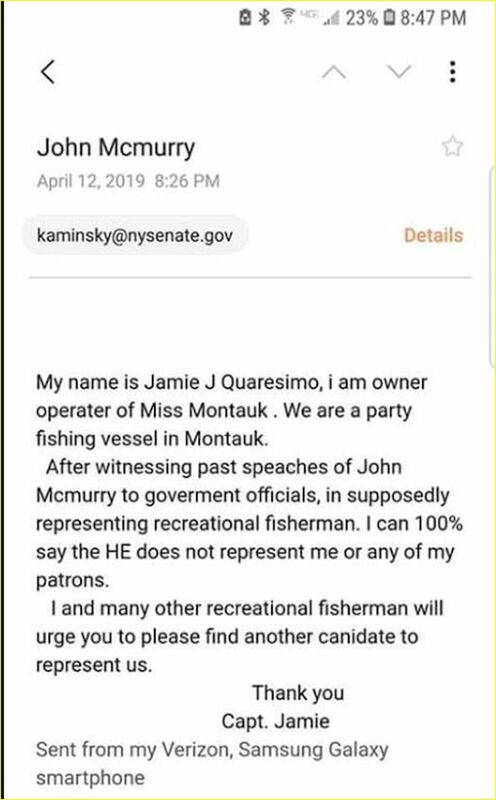 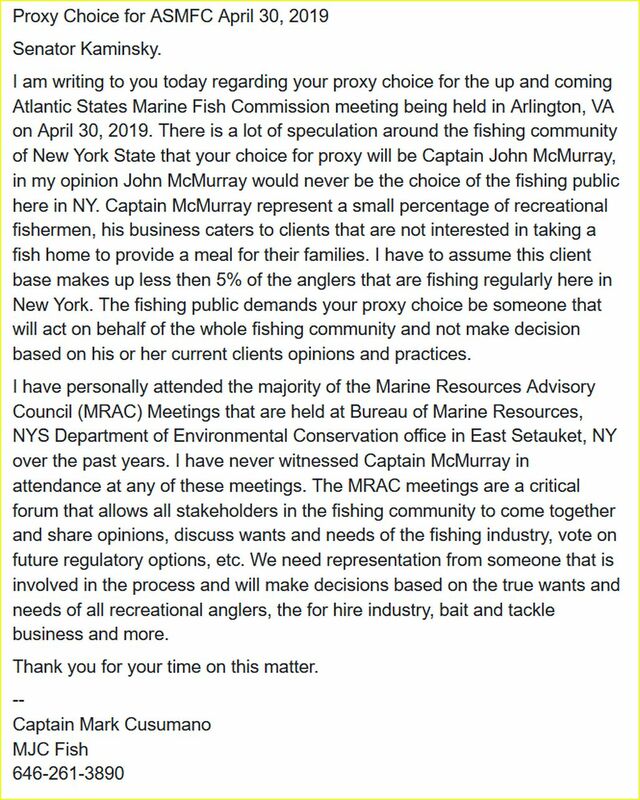 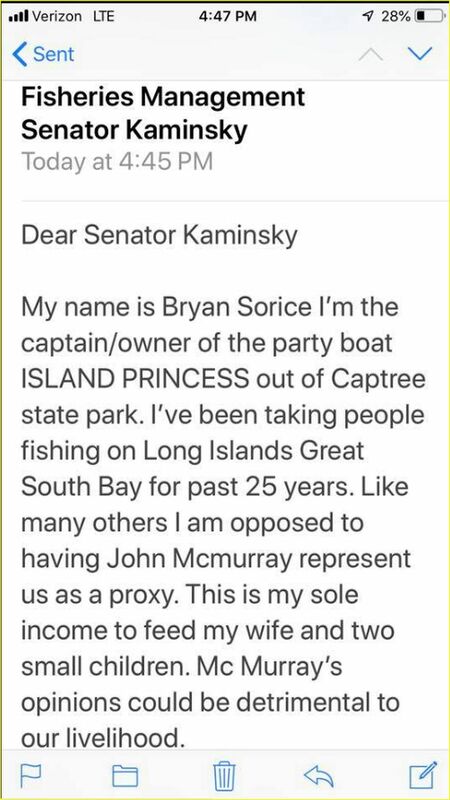 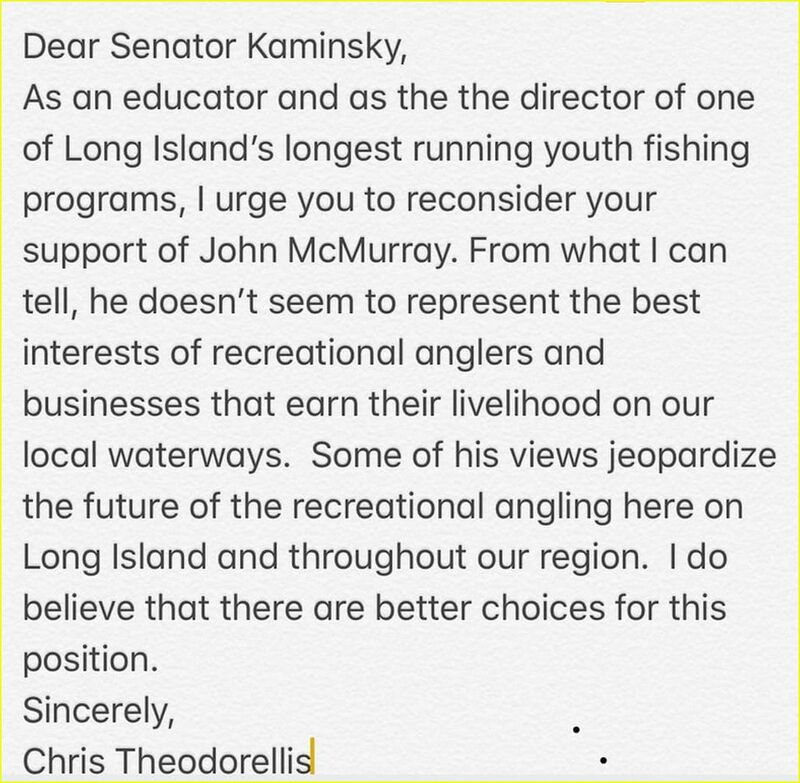 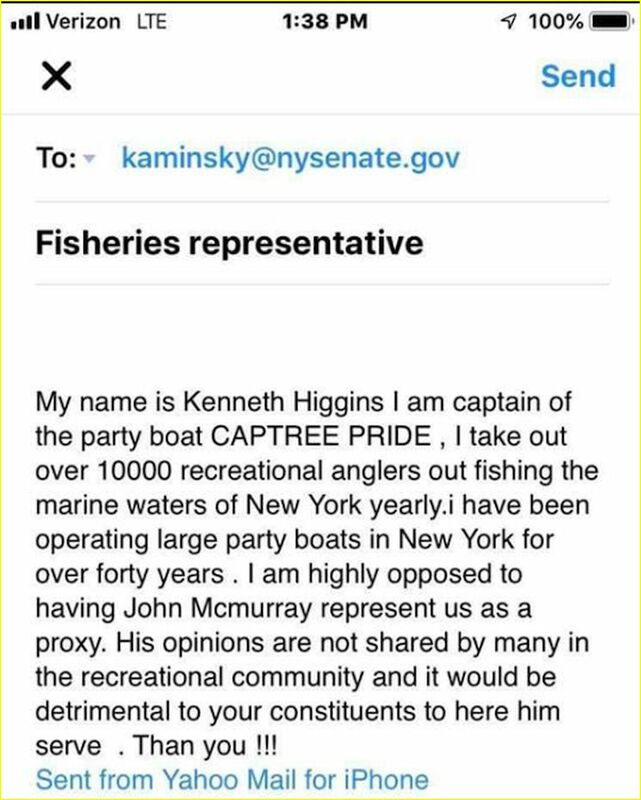 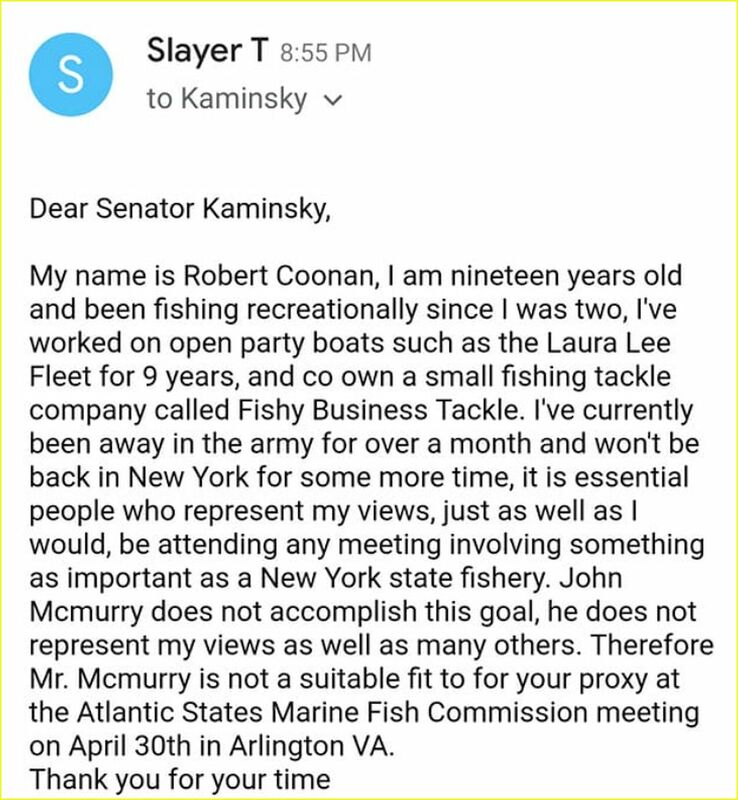 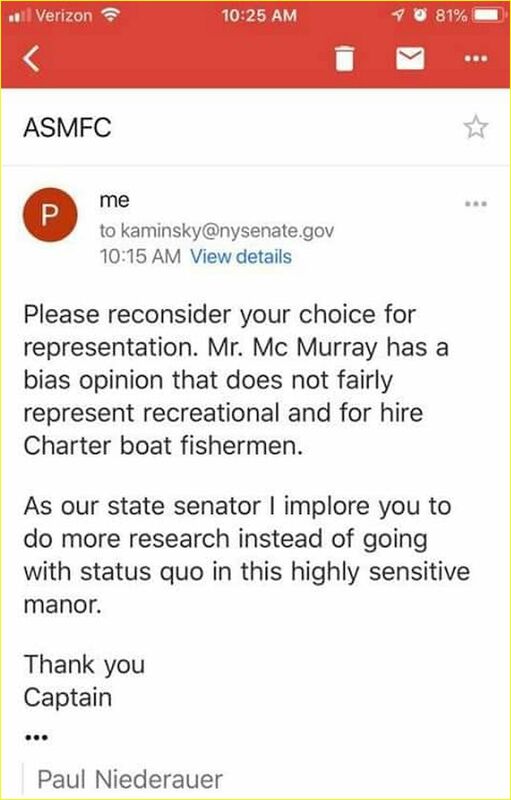 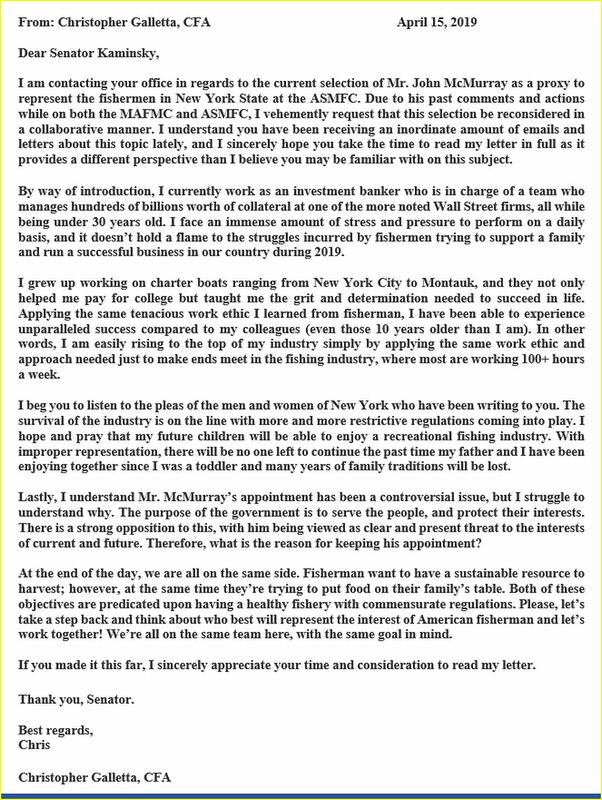 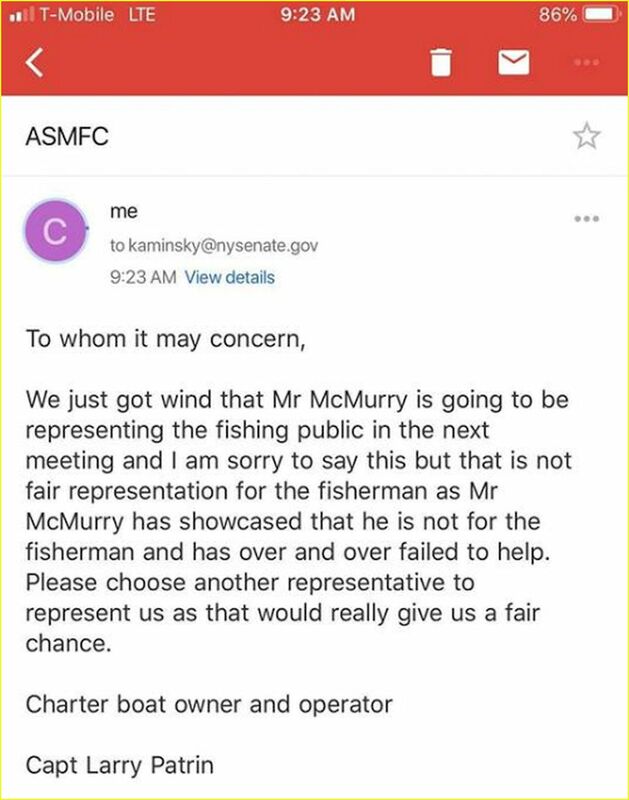 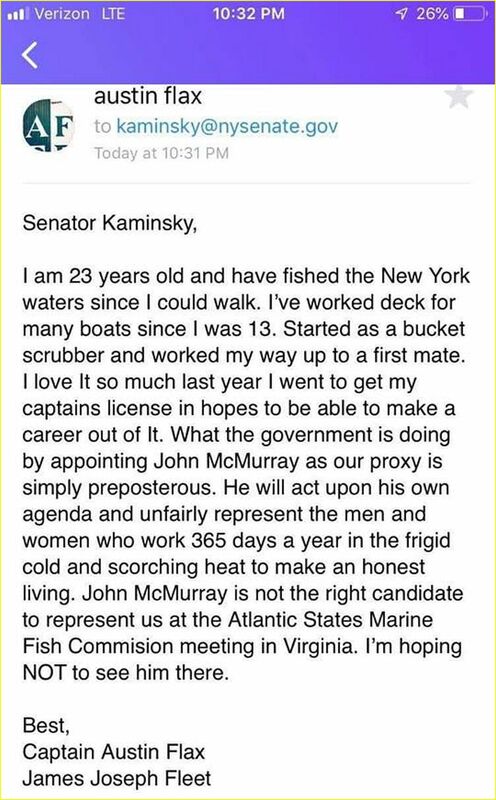 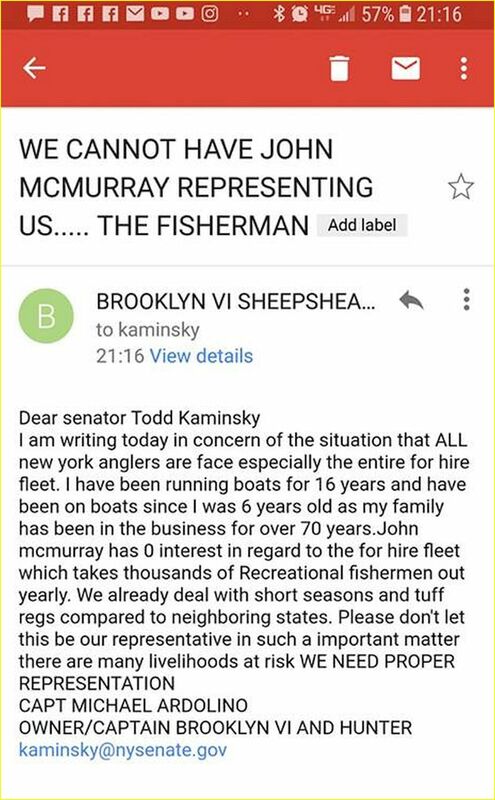 I am posting short of three dozen emails and texts sent by you, the fishing community here in the NYS Marine Coastal District that have been forwarded to NYS Senator Todd Kaminsky on the issue with Captain John McMurray remaining as his proxy for the ASMFC. 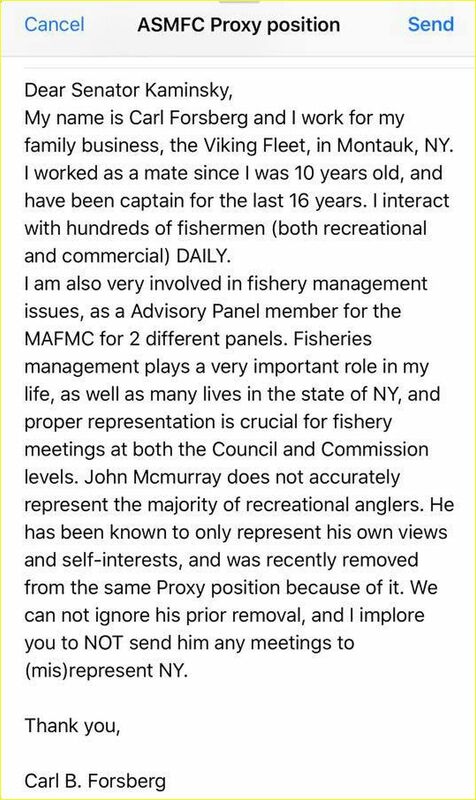 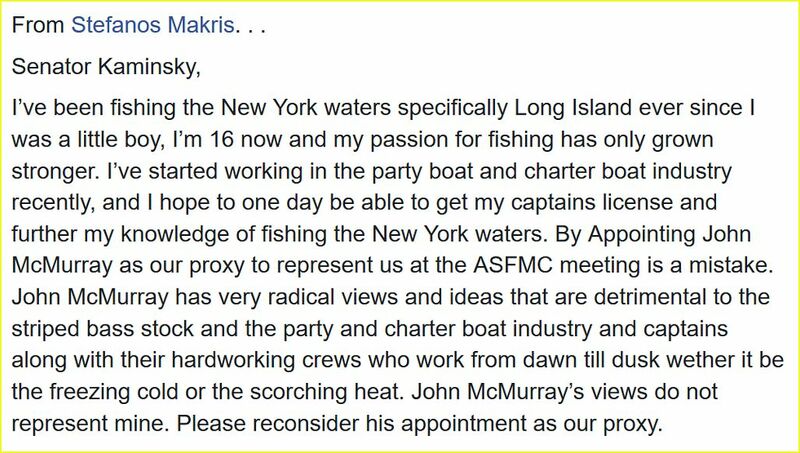 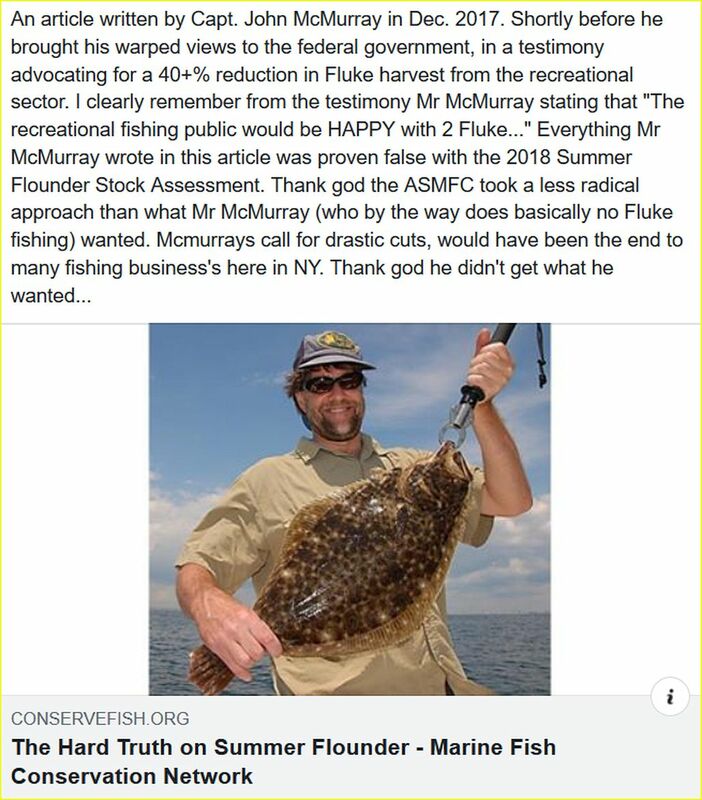 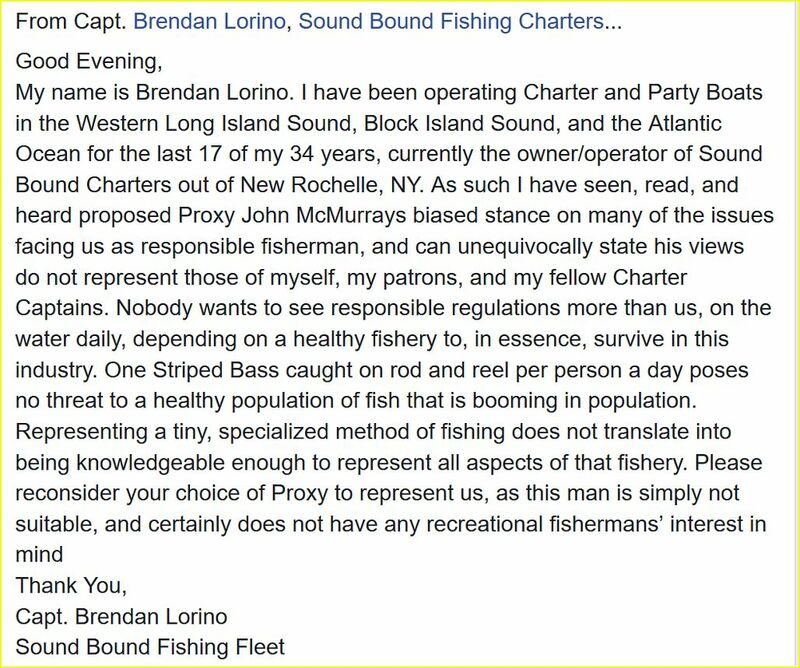 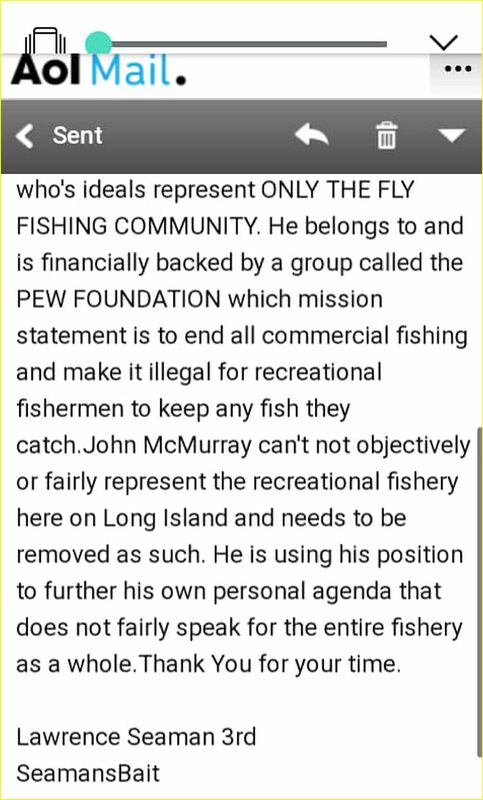 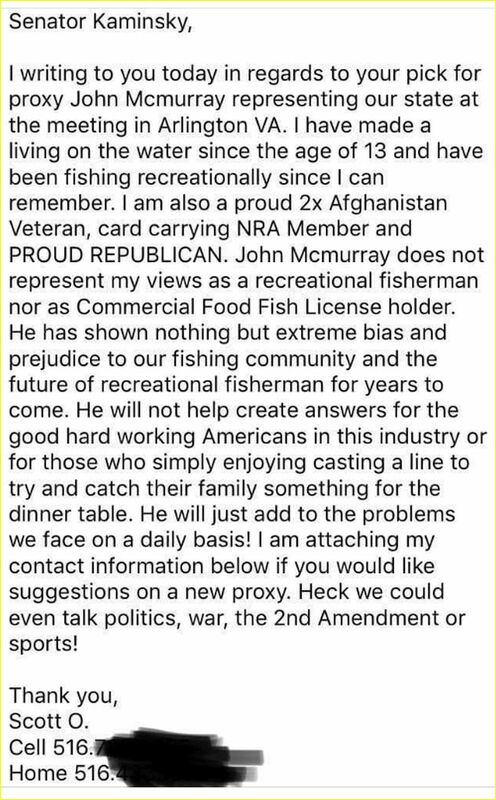 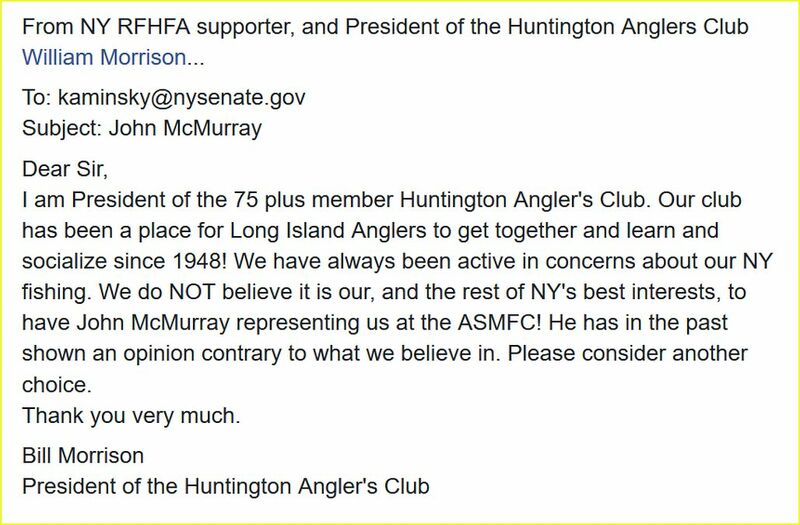 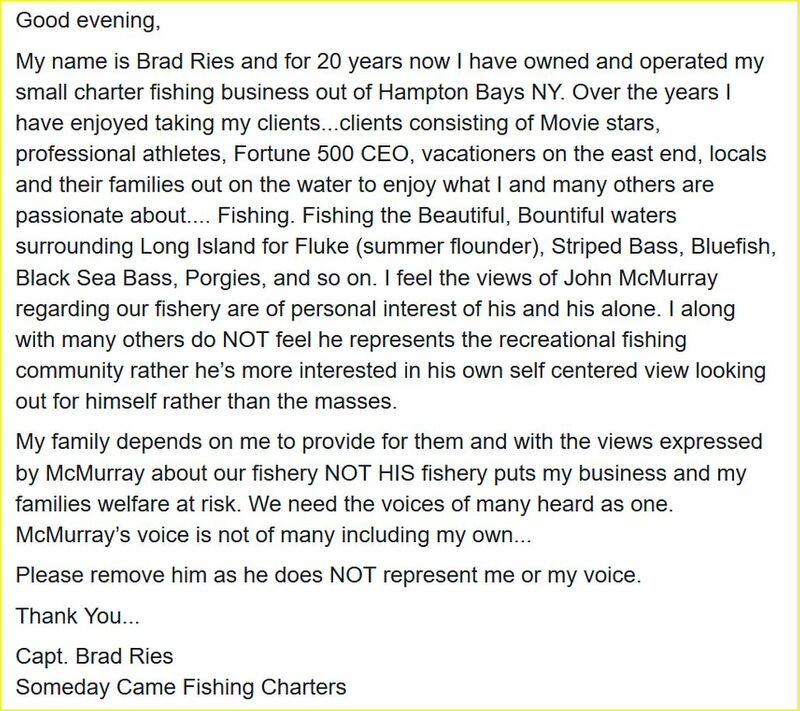 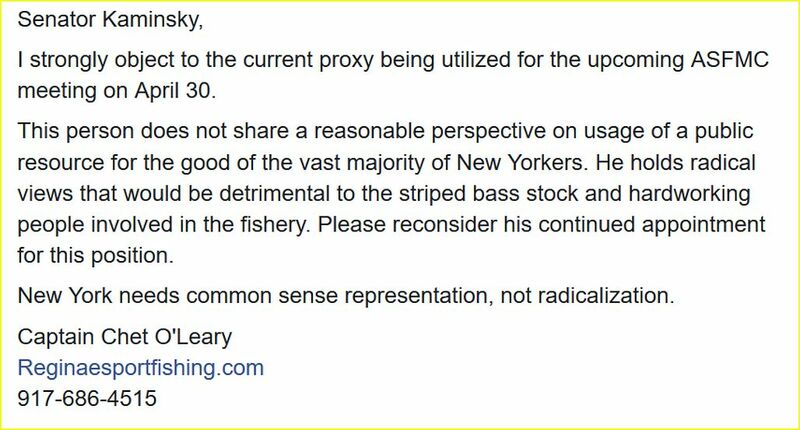 The reasons are varied, and as you see from reading through a diverse audience of people/fishermen who have posted their comments on John McMurray, it is pretty obvious that few can tolerate such an individual being a fair representative for both the fishing industry and the people who enjoy fishing out of New York. 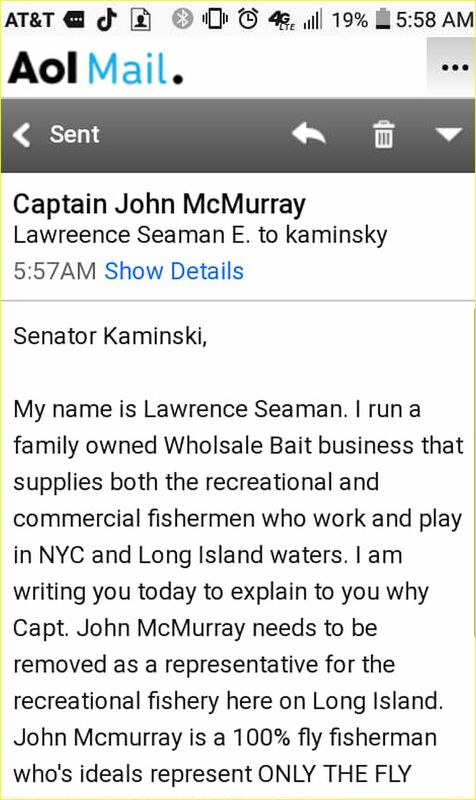 Folks, I also want you to note that everyone of the posted images will document that this is not a copied standard form email with a persons name on the bottom. 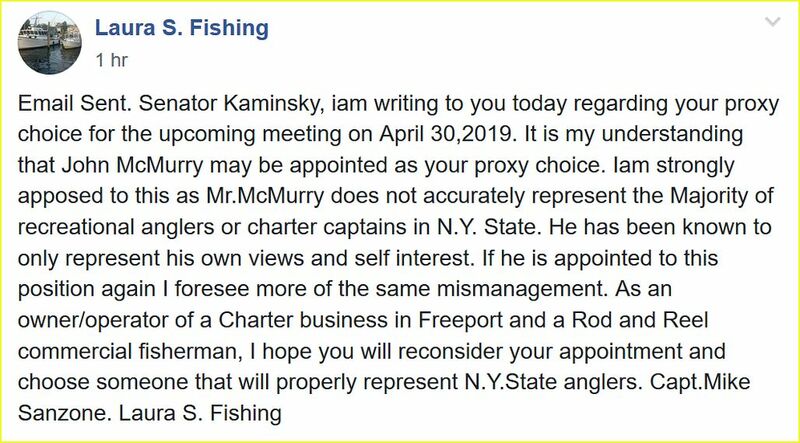 Far from it as one will see how the fishing community is reacting to someone who has a number of years fighting against fishermen and as much, the NYS fishing industry who have been saddled with most onerous recreational regulations at this time. 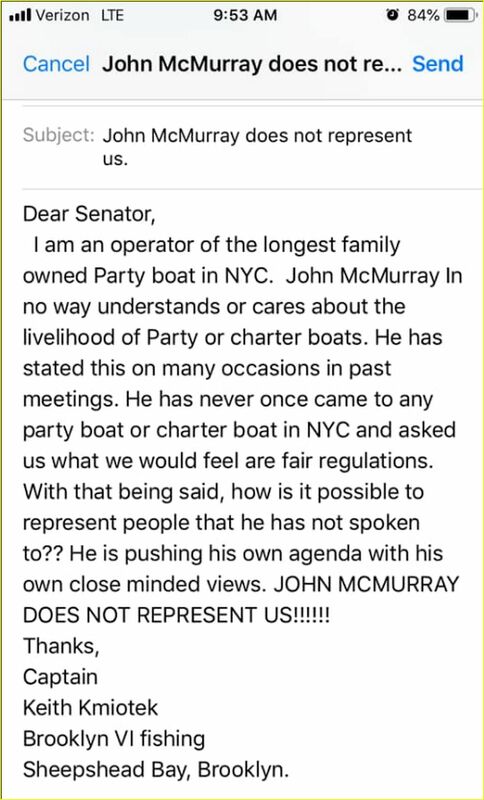 I will let you make your own judgement here, but you can sense that John McMurray may be one, if not the most disliked individual (that is saying something!) 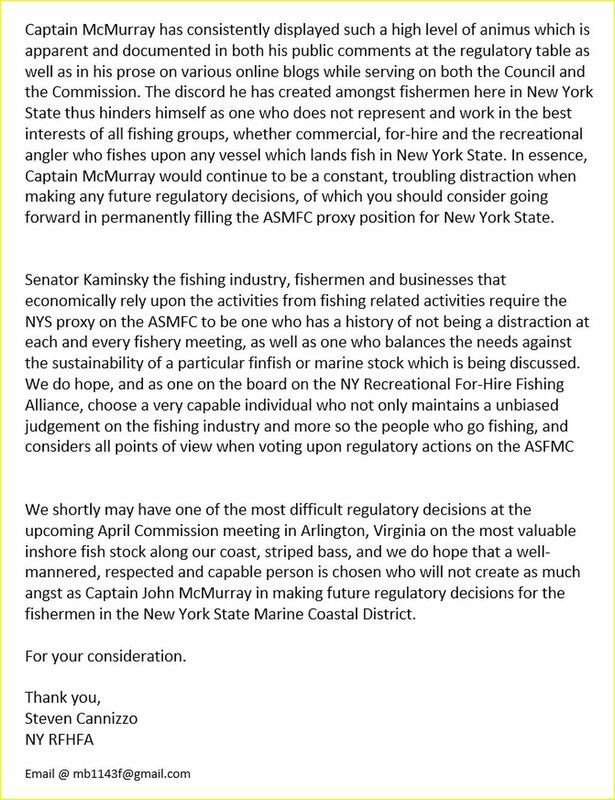 involved in the NYS Marine Coastal District fishery management. 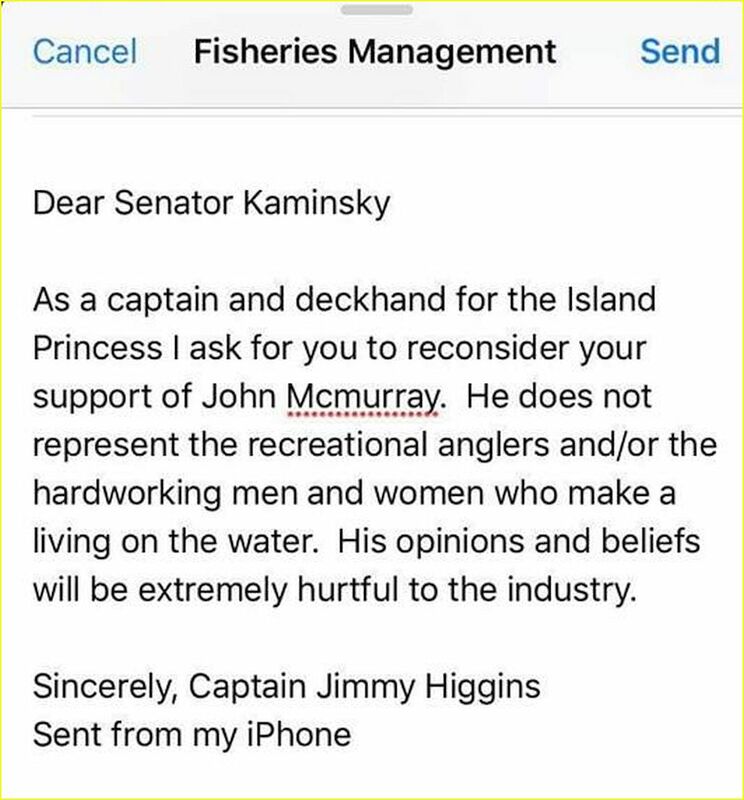 In fact it is a sad testament to the character and eventual legacy of John McMurray to what he has done to the fishing community in our state. 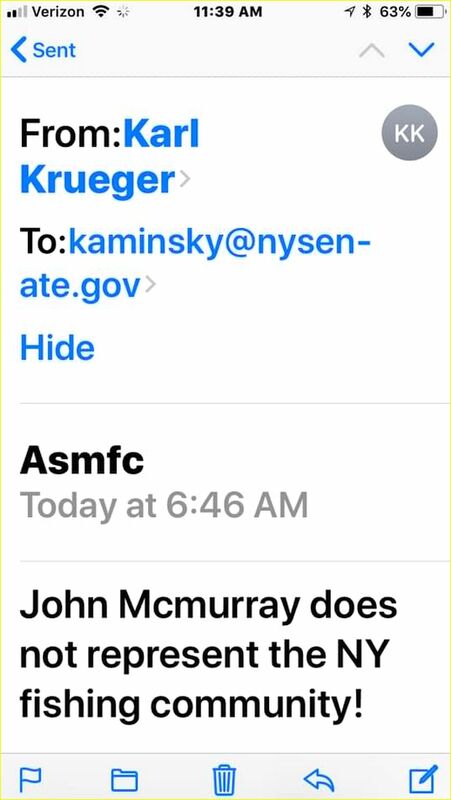 Finally I like to add that I spoke with John yesterday over his staying on as the ASMFC proxy, and he was very cordial and understood the push back against him for remaining as a temporary proxy for NYS Senator Kaminsky. 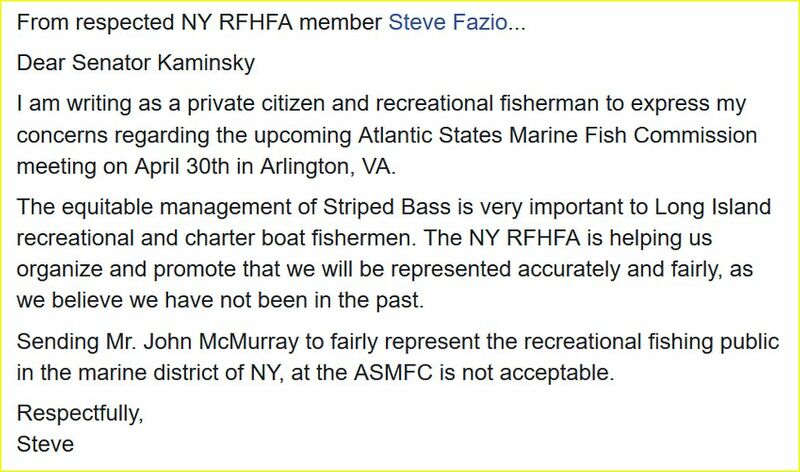 Though we have opposing points of view on the regulatory environment, we do agree to an extent on a number of issues with striped bass management. 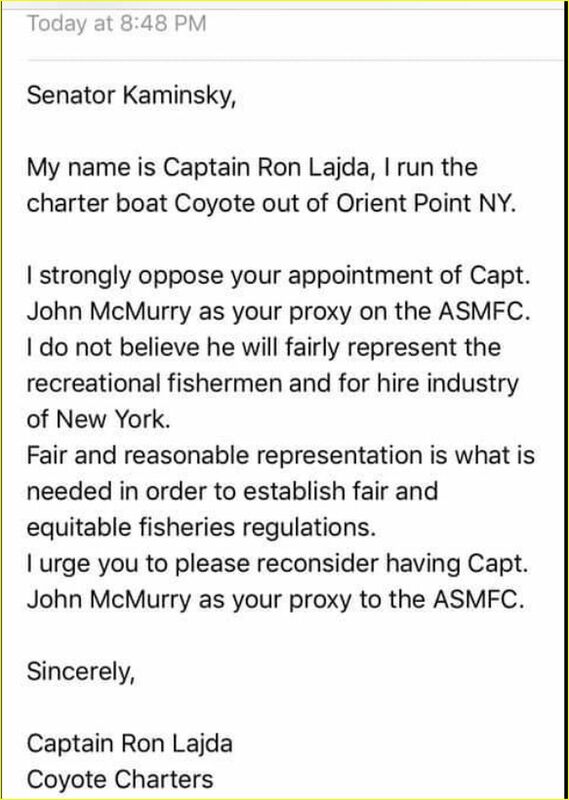 The point here with John is that no one trusts him as far as what he will mention to you off the record, and what he will do as a representative for NYS on the ASMFC. 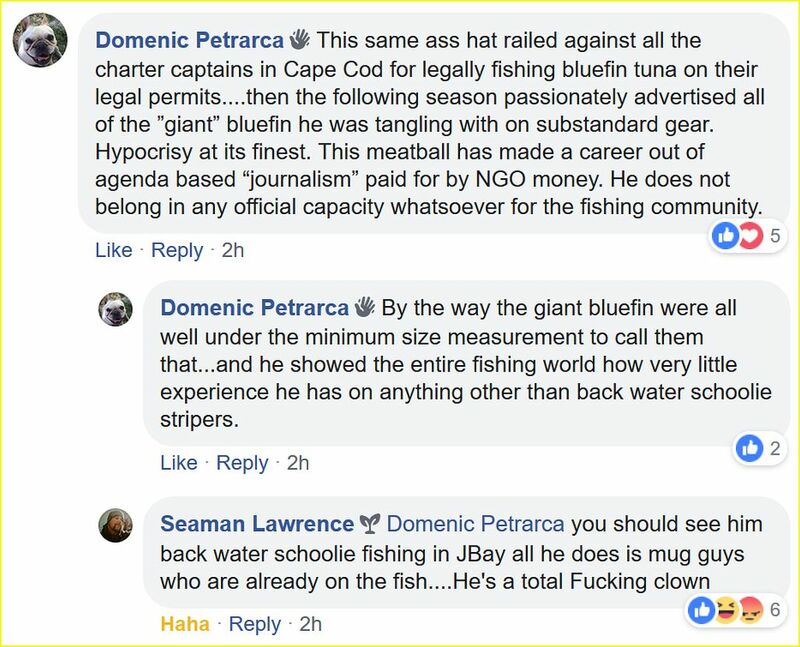 Shame is that he is an articulate individual, but has a long track record which is very obvious from reading the thoughts from the fishermen below. 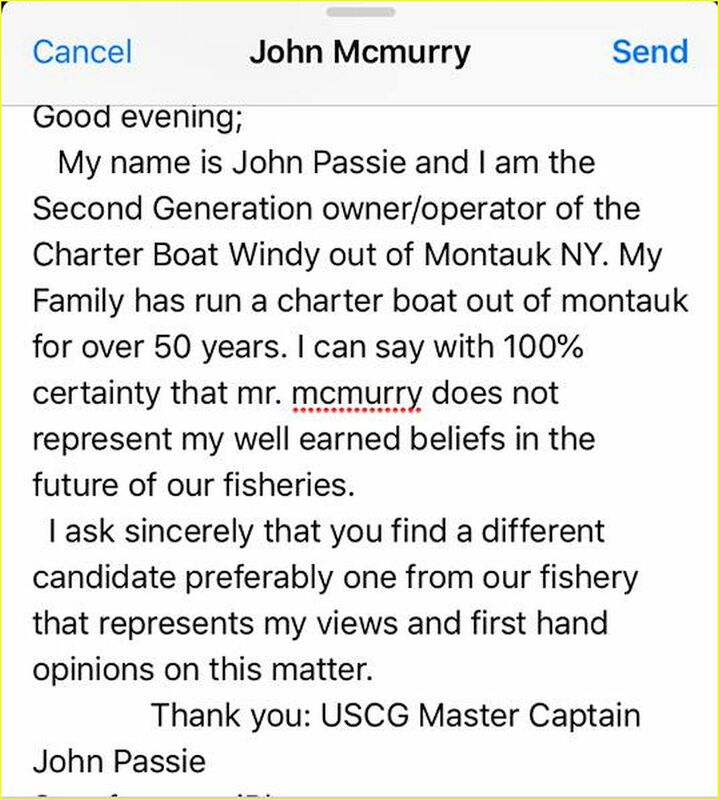 Ps...I am allowing the language to stay in the comment to provide the context of the feelings about Captain McMurray...and we always will allow John to rebut, clarify, restate and post any response here.